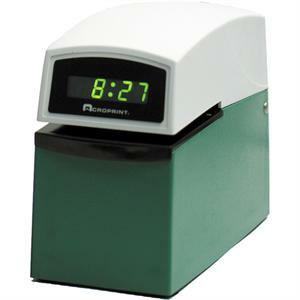 The Acroprint ETC is a heavy-duty mechanical time stamp with a digital display. It is designed to print on documents quickly and can penetrate mulitple copies. Its automatic print mechanism allows for convenient one-handed operation. Use it to print year, month, date and time on important documents such as mail, purchae orders, and shipping/receiving documents. With the addition of options upper and/or lower engraved die plates you can customize your stamp for your needs. Quality designed timing motor provides the highest accuracy. Digital Display to eaily read the time of the clock. Electornically controlled printing provides clean, instant registrations. Print control adjustment allows for multi-copying. Precision metal typewheels designed to withstand thousands of prints per day. Automatic and reverse ribbon feed assure a longer ribbon life. Impact / corrosion resistant case holds up to harsh environments. Sturdy security lock prevent unathorized tampering. Accepts items up to 1/4 inch thick. Dimensions: 7.75" x 5" x 10.25"